Sunday 21 Apr - Latest - Check the listings below for the latest online stock. The Nintendo Switch Console was launched on the March 3rd 2017. We constantly track stock to ensure you will be the first to know when availability is found. NEW - Receive instant stock push notifications on your Android mobile device or desktop PC/MAC. View My Profile to setup. 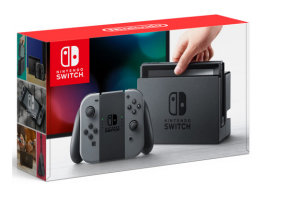 The Nintendo Switch is a video gaming system designed to allow the user to play the same game either in the comfort of your home TV or on your travels wherever you may be. You simply lift the Switch Console from its dock and continue playing your game on the console's own high definition screen. The Nintendo Switch brings the power of home video gaming to the handheld market. Where can I find Nintendo Switch Console stock? Use our unique stock listings to locate stock as soon as it becomes available at our panel of top UK retailers. Our servers are constantly checking for stock to ensure you are the first to know when availability is found. During busy periods Nintendo Switch stock can literally sell out in minutes, it is therefore crucial you know quickly when stock is available to buy before it sells out. We constantly check for Nintendo Switch stock, so you don't have to. Receive email alerts when Nintendo Switch online stock is found. For additional Stock Alerts, LIKE our Facebook page and FOLLOW us on Twitter.